In a previous blog, I have announced that we plan to publish the REST API that allows you to implement your own Secure Login Clients. Here we go. In general, Secure Login Server 3.0 responds with REST objects that need to be parsed and interpreted by your client. Your client requests don´t contain REST or JSON, but HTTP headers and forms. integer messageType[0,1,2,3];    # "0": "ok", "1": "warning", "2": "error", "3": "no icon"
integer messageStatus;           # textual representation of messageType: "ok", "warning", "error", "none"
Your client has to return all requested input fields with the specified names and user values in URL encoded form. 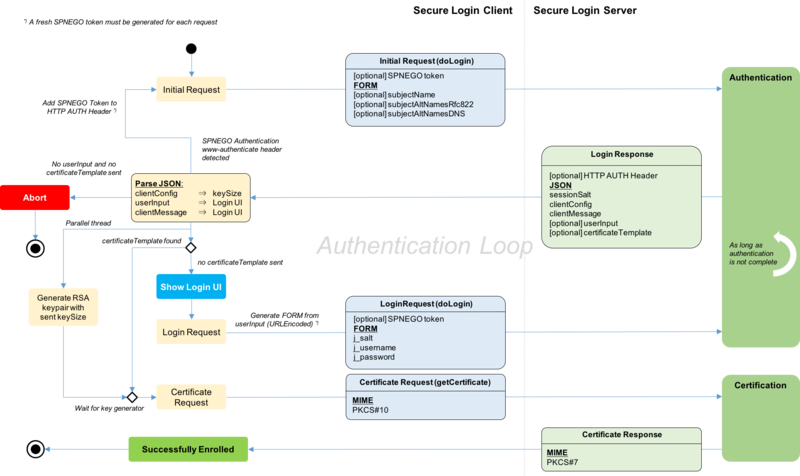 Only in the initial request, your client may also give some desired certificate name properties which can be considered by Secure Login Server for the generation of the returned certificate template REST object. This is helpful for automated requests for servers or unattended clients, e.g. in a Certificate Lifecycle Management scenario. Secure Login Server has to receive a correct and complete PKCS#10 certificate signing request from your client. Especially if a Remote CA is used, Secure Login Server is unable to change and re-sign the request. To allow your client to create such complete PKCS#10, Secure Login Server tells you which certificate attributes you have to add. This is done once the authentication loop is completed. Secure Login Server now sends a certificate template REST object. You take over the DER encoded ASN.1 blobs. This is only possible if you use a security or crypto toolkit for your own client that supports ASN.1 construction. You take over the string representatives and construct the respective X.509 certificate extensions. This also requires toolkit capabilities, but usually it´s a higher level API. If your Secure Login Server version is lower than 3.0 SP01 PL01, your ASN.1 DER encoding must match exactly with the blob you have received. Beginning with PL01, the comparison algorithm is more tolerant and accepts a different order of extensions as well as different string encodings in name attributes. This tiny NodeJS program is able to illustrate all kinds of Secure Login Server 3.0 authentication mechanisms, except SPNEGO. You should run Secure Login Server 3.0 SP01 or later. If you like to implement your own client, try to get the sample running with your server first. You can learn a lot, with full access to all HTTP requests and responses. // Demo for interactive multi-step authentication with Secure Login Server 3.0 and REST protocol version SLC3. The subjectName must be PrintableString encoded, not UTF-8. The sample code was already considering this.